Paper Wars: Cannon Fodder Devastated is barely a game. Whether relying on touch controls or buttons, the majority of your time will be spent holding down your finger until a gauge fills and a shell is launched from a tank and into enemy infantry. Occasionally power-ups will appear on the battlefield and require a swift tap – there is no clear prompt as to what button you use if you prefer the sticks for control – but otherwise, everything comes down to watching a power meter climb from red to green, before letting go and killing a wave of soldiers. You play a general, who must stave off waves of oncoming soldiers by firing from a tank on the sidelines. It’s not quite a tower defence, but that’s the closest example. New shells are occasionally available which switch out the usual damage for cluster bombs. It’s all very ‘rinse and repeat.’ The power-ups sometimes lend the game a little variation; you can reverse or slow down waves, set off landmines or speed up your tank’s firing capability – all for limited periods of time. Sure, after a few levels there will be variation in the enemy – some move faster than others, certain troops require more damage to dispatch them, but the gameplay rarely changes. You’re ultimately tasked with killing a certain number of soldiers before a time limit expires, you can allow a few to slip through the net or kill a few of the wrong type, but more than a particular number will see the mission end in failure. If you use the touch screen, you’ll aim where you would like your tank to fire, using the stick will drag the reticule around the playing field. Several difficulty levels stagger the speed and armour of the combatant troops, but increasing such a minor thing does nothing to give you value for money. 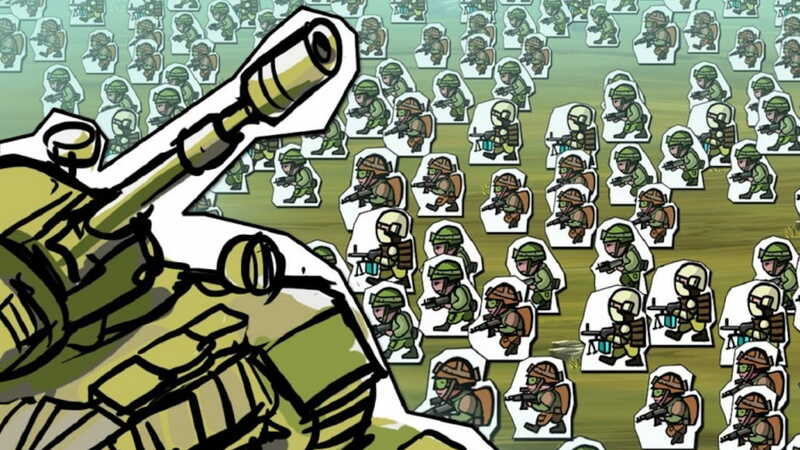 Paper Wars: Cannon Fodder Devastated is yet another cash-in of a game moving from the App Store to the Nintendo eShop and while the developers are expanding their audience, they need to do a lot more than just port the game over to capitalise on a few extra bucks. There are stat screens and variations on the formula, but notably, nothing really changes anything beyond the concept and there’s practically no story to bolster the playing experience. If anything the developer plays off of the design a little too much – with backwards or upside down letters that are intended to build on the quirks of the visual style but do nothing more than irritate – visual style can only carry you so far. If it seems like I’m frustrated with Paper Wars: Cannon Fodder Devastated, you’d be correct. So much could have been done with the concept and, in fact, a standard tower defence game would have been ideal for a system that has very few of them right now. The basis of this all happening in a world of paper could have been expanded through a story of a child at play or practically anything else. Yes, the visual style is quirky and the idea spins the tired genre of tower defence on its head – which may or may not be welcome, depending on your mileage in the genre, but there’s very little to be gained from the game. Paper Wars: Cannon Fodder Devastated is little more than a title you’d buy on sale for a couple of pounds, play for five minutes and forget it exists.